Doc Burnstein's Ice Cream Lab is located at 114 W. Branch St., Arroyo Grande; 860 Higuera St., San Luis Obispo; and 725 E. Betteravia St., Santa Maria. Hours are Sunday through Thursday 11 a.m. to 10 p.m., and Friday and Saturday from 11a.m. 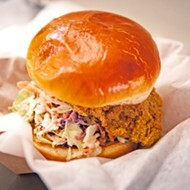 to 11 p.m. For more information, go to docburnsteins.com. It's been almost 15 years since Aug. 22, 2003, the day Doc Burnstein's Ice Cream lab first opened its flagship shop in the Arroyo Grande Village. Sure, owner/founder Greg Steinberger was pumped to see his dream come to fruition. However, there was someone even more pumped about the opening on that hot summer afternoon. It was 11-year-old Jens Wagner, who held his own at the very front of the line. As Doc's "honored first customer," the sixth-grader knew he would be granted the mind-blowing privilege of creating his own flavor. 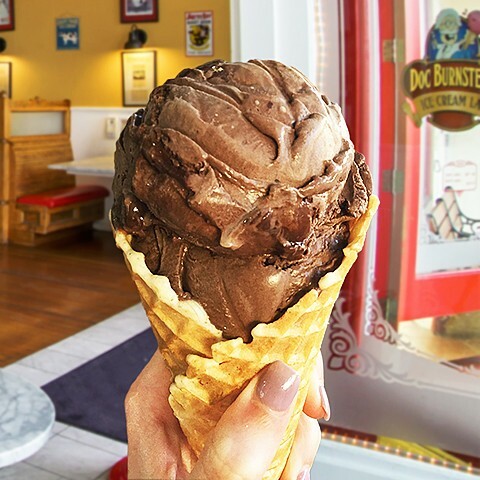 YUMMY ALL OVER Over the past 15 years, Doc Burnstein's has churned out dozens upon dozens of scoop flavors, plus shakes, ice cream cakes, and indulgent fudge. That's not all. His picture was taken for the local press, and he was able to scoop his own towering cone for all to see. You could say he was the envy of all his classmates at Branch Elementary School come fall. "He was big into basketball, so he made his own 'Slam Dunk Chunk,'" Steinberger reminisces about that momentous day. "I remember that for the basketballs, we found round chocolate balls filled with peanut butter." On Saturday, Aug. 18, 2018, Doc Burnstein's will invite back that extra special guest scooper, now all grown up (still with a gnarly sweet tooth). The super sweet 15th birthday party includes 15 percent discounts for Doc's loyalty customers, prizes, and the kind of theatrical shenanigans you've come to expect from the community-owned corporation helmed by a fictional mad ice cream scientist. A grand prize ticket will be rewarded to a randomly selected customer, granting a sought-after tour of the lab for 15 of the lucky winner's closest friends and family, with the opportunity to invent a new flavor and meet "The Doc" himself. 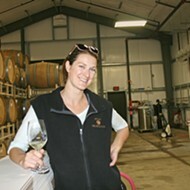 If you ask Wagner—now a Bay Area high school chemistry teacher—there is no greater way to spend a summer afternoon. Whether it's 2003 or 2018, the same butterflies float in his tummy. 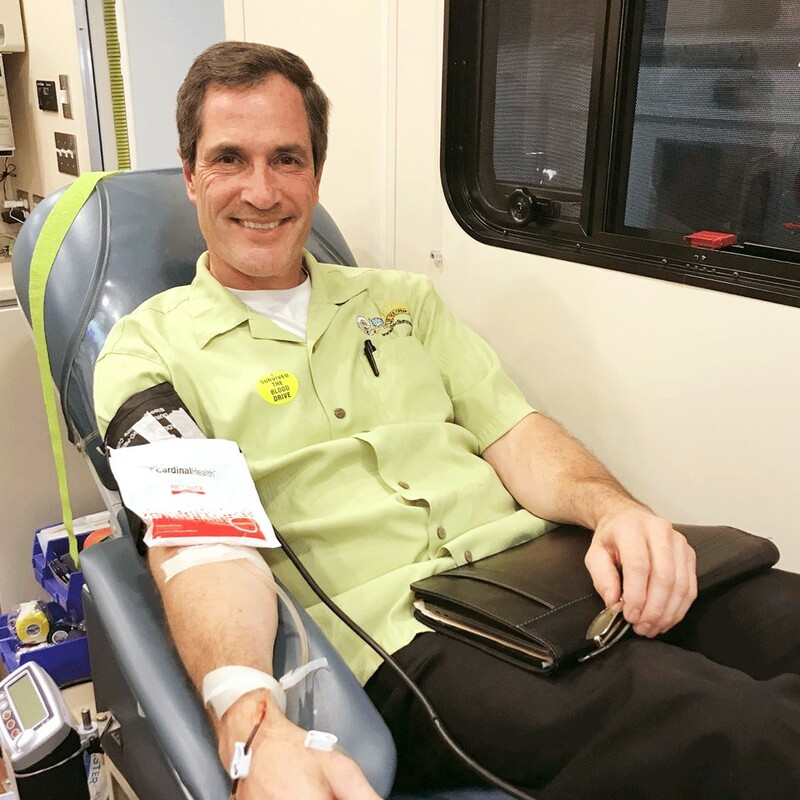 LASTING LEGACY Doc Burnstein's founder/owner Greg Steinberger gives back to the community by giving blood. The company has continued to partner with United Blood Drives and incentivizes the practice by donating a pint of ice cream for every participant who donates a pint of blood. "Doc's is still the one place I must visit whenever I come home to Arroyo Grande," he said. "I have such fond memories of waiting in line on that hot August day, to scooping my very own Slam Dunk Chunk, to seeing a student of mine working behind the counter." 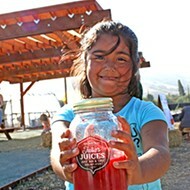 Yes, you can even try Wagner's "vintage" Slam Dunk Chunk this Aug. 18 for one day only, scooped by the big kid himself. 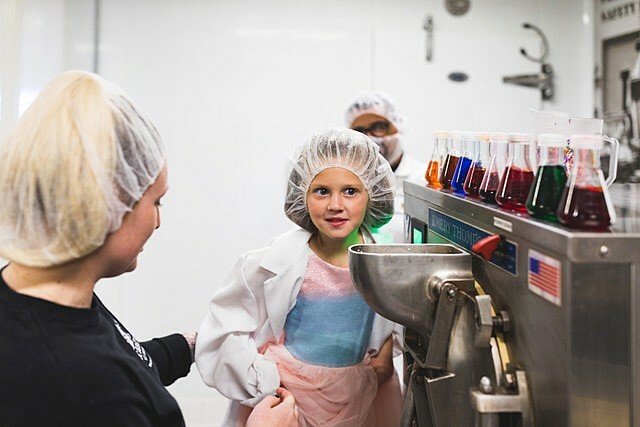 A LITTLE SWEETNESS Make a Wish recipient Maysie creates her own ice cream flavor at Doc Burnstein's Ice Cream Lab. 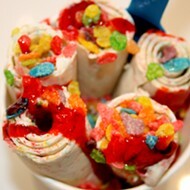 Her creation, "Unicorn Swirl," features strawberries, pie crust, and a white cake batter ice cream. Every scoop sold delivers 25 cents to the foundation. "We couldn't find those peanut butter balls, so we're using malt balls," Steinberger said with a chuckle. "Of course, there's still the chocolate and caramel swirl Jens chose, because, well, who doesn't like chocolate and caramel?" This is a good question, and one that cuts to the heart of the Doc Burnstein's all-American brand. Although you can now find gluten free options, and soon a few new vegan options, you will never find "rosemary-tarragon" on the menu. 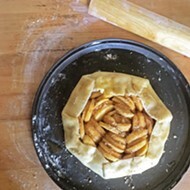 "People want to try unique flavors, but they also want to come back to what they love. We are more of a traditional ice cream experience. Ice cream, for me, is about remembering what I had when I was a kid," Steinberger said. In general, Doc's ice cream boasts a higher cream content, and the flavors tend to feature real fruit but also comfort food mix-ins like Oreo cookie crumbles (note: seriously, not organic). That said, Doc's isn't behind the times. 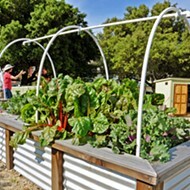 The corporation is currently working to create a more local supply chain that will reduce impact on the environment. The most important element we've all come to know from this wacky ice cream brand? The newly opened Santa Maria location has been designed to delight in more ways than flavor. Kids can now get a riveting interactive ice cream experience—after a few tugs on a lever and the addition of some "mystery ingredients," a life-size "Frankencone" seems to come alive, flashing lights and springing forth with gusts of cold air. 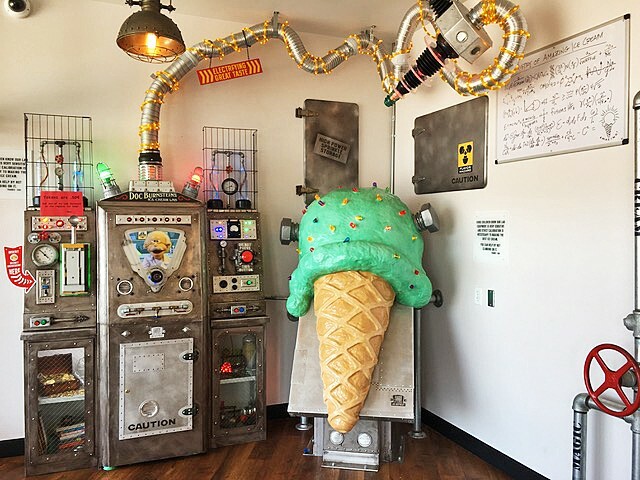 IT'S ALIVE Kids can get a riveting interactive ice cream experience at Doc Burnstein's Ice Cream Lab in Santa Maria, where—after a few tugs on a lever—a life-size "Frankencone" springs to life. While the SLO location features a more modern, low-key vibe for students and tourists, Steinberger has always looked for ways to enchant young minds. The Arroyo Grande location—which features a toy train that chugs around the perimeter of the store—will premiere its own dazzling interactive Frankencone experience during the birthday celebration. You could say Steinberger wears his greatest influence—the great, fictional, purple-top-hat-wearing character—on his sleeve. "When I started the business, I was trying to think of what my model would be, and Willy Wonka was part of that. What we offer has a nostalgic feel, but is also totally creative and whimsical," he said, adding that the store even gives out "golden tickets" printed on gold foil reminiscent of the 1971 classic movie. 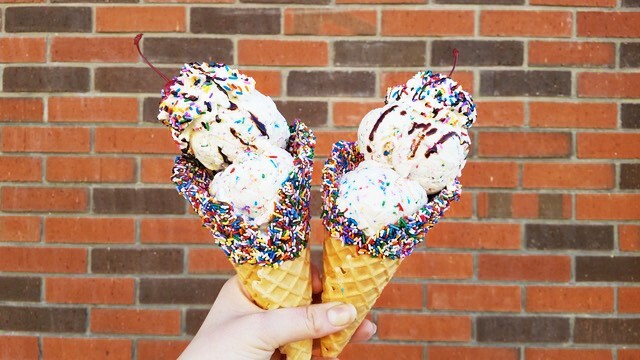 These tickets offer up free ice cream, but also something else. 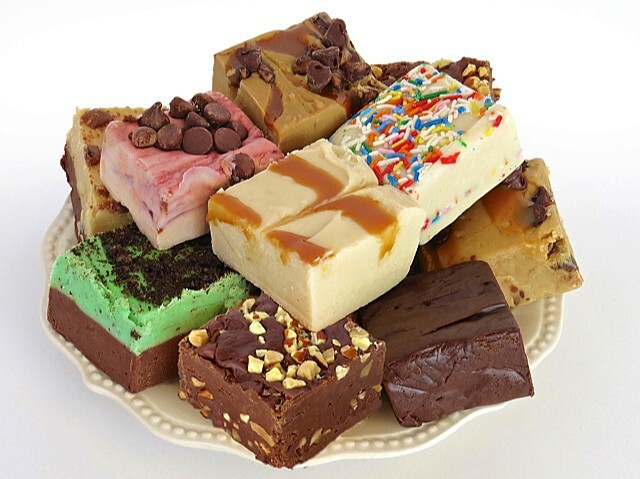 Assorted flavors of SilkFudge from Doc Burnstein's. "I like to say, 'We aren't in the ice cream business. We're in the memories business,'" Steinberger said (touché, that is a very Wonka thing to proclaim). And while the real Willy Wonka—as crafted by adult-shaming Roald Dahl—is kind of off-kilter and maybe even a little deranged, "The Doc" is most certainly a benevolent leader. From partnering with nonprofits to put on much-needed blood drives to offering a Make a Wish Campaign that raised about $15,000 (enough for three wishes for kids with life-threatening illnesses), to giving back to the community as a registered benefit corporation—there is a lot of sweetness to go around. Perhaps this is how Doc's creates not just customers, but die-hard fans. The kind of fans that would travel hundreds of miles just to take part in a 15th anniversary party. Waffle cone from Doc Burnstein's. Wagner is prepping his scooping arm as we speak. He's ready for the task, and the gloating that he'll still be able to do. Hayley Thomas Cain smells like Snozzberries. She can be reached at hthomas@newtimesslo.com.